CELCIUS is your premier engineering and purchasing resource for airsoft BBs. CELCIUS BBs are high precision ball bearing machined parts with tolerances and raceway finishes that are measured in millionths of an inch. The roundness, smooth surface finish, and hardness, are controlled carefully. The raceway finish, cage quality, ball matching and consistency of internal geometry can affect the performance of an individual BB during its application. Therefore, each of those characteristics of the BBs is normally determined by the level of material, and the equipment used to manufacture the BBs. CELCIUS HIGH PRECISION BBs are designed to reach the maximum balance, precision, and accuracy. Production of extremely precise BBs is a very difficult than is generally appreciated. Our purpose to manufacture detail and design BBs has lead to BBs to their finest grades. 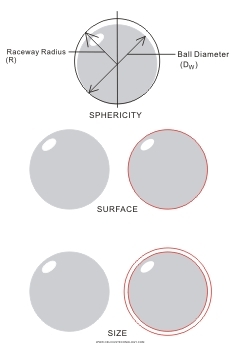 Variables, such as diameter and weight variation, have been carefully controlled, but even more important are features which are not easily measured. Defined as the smoothness of the BBs' surface. It must be free of flats surface, pits, soft area, and cuts when inspected. Diameter, measured between two parallel planes on the BBs surface. The intense concern with perfection in design and manufacture of High Precision BBs formerly had been applied only to CELCIUS HIGH PRECISION BBs. This has great significance to the shooter who wishes to extract maximum performance from the gun, and to maximize the chance of success when firing at the outdoor area.